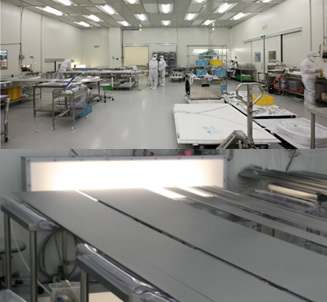 We perform the special cleaning / surface treatments for semiconductors, flat panel displays (FPD) manufacturing equipment and experiment systems which need ultra high vacuum (UHV) / extreme high vacuum (XHV) environment. Cleaning and degreasing for achievement of UHV / XHV environment. Aluminum, stainless steel,titanium etc... To accomplish of the ultimate vacuum property by CP for exclusive use of each metals + SMC ! To accomplish of the ultimate vacuum property by high quality EP + SMC ! To remove extraneous matter from parts of film-forming equipment. We have ICP-MS, Ion chromatograph and etc... to verification of cleanness assessment.